We all make stupid mistakes. You borrow your friend’s car and accidentally back it into a pole. You instant message the wrong co-worker, telling her a personal story meant for someone else. These mistakes are pretty painful at the time, but luckily they’re are all slip-ups that will (eventually) be forgotten and forgiven. Unfortunately, there’s one mistake that can’t be erased: Taking a picture of yourself wearing really bad makeup and posting it online. Remember, things live FOR-EV-ER on the World Wide Web. That’s exactly how we found these pictures of girls wearing ridiculous makeup. We’re not trying to be mean, we just thought these pictures were bad enough to bring to your attention. In fact, we even think these real women are brave — or a little nuts — for not caring what people think about their makeup, and freely posting their photos online for all to see. But, that doesn’t mean we’re not going to continue sharing them across the net. (Sorry, girls.) 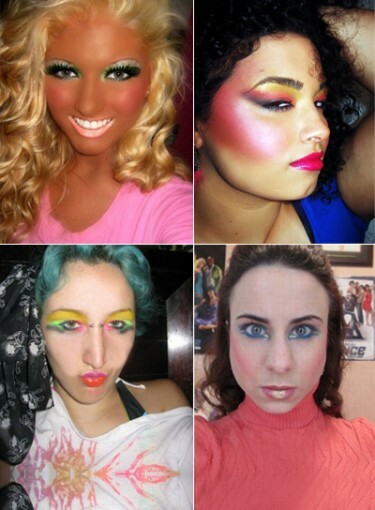 Keep clicking to see the gallery of the worst makeup on the Internet. Editor’s Note: Hey guys, just wanted to address some of the comments on here. This has definitely sparked a lot of debate, which is great. I want to make it clear that we’re aware some of these looks are parodies (as are our comments about them), but to make it clearer we went back through and labeled them as such.